Our goat yoga has been featured in local publications including The Pittsburgh Gazette, Pittsburgh Magazine, PennLive.com, and The Incline. My wife and I own a number of wooded acres in Northern Washington County. Primarily used as a place to go relax on weekends, just maintaining the property was quickly consuming the entire time we were spending at our place with little left over for other projects and/or relaxation. 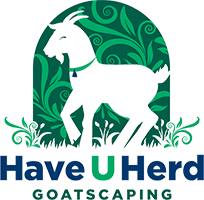 We had discussed Goatscaping as an option and when we came across "Have U Herd" we decided to give it a try. Rainy and her "Team" quickly got to work clearing underbrush and debris from a large wooded area that had always been a problem to maintain due the abundance of thickets and the steep terrain. The smaller goats devoured a lot of the weeds, grasses (and Poison Ivy) while the larger animals were able to attack the larger shrubs that made the area unpassable. In just a few days, Have U Herd eliminated unwanted and invasive plants that had been growing for years, creating some much needed breaks and making the area much more attractive, with much less impact to the environment than if we had used a brush hog or other equipment. I would highly recommend Have U Herd. Rainy was a delight to work with throughout the process. We knew almost nothing about the goatscaping process beforehand and she walked us through the entire process, telling us what to expect and explaining how the goats go about their work. Rainy was prompt, professional and there were absolutely no surprises from beginning to end. In face my family and I grew so attached to the goats that we were sad to see them leave.